The Anets Pasta Pro is a safe, simple way to make perfectly cooked pasta. Anets offers a safe, consistent and easy way to make traditional pasta. 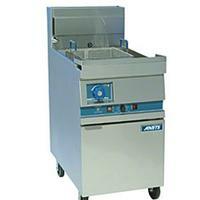 This self contained system eliminates handling heavy pots and hot water. Quick, efficient heating system brings fresh water to a boil in less than 10 minutes. Super sensitive thermostats accurately control the boil from a soft simmer to a hard boil. Cook more than just pasta, blanch vegetables, boil seafood or reheat sauces in this all purpose water cooker. Add upgrade features like timers, automatic lifts and computer controls to assure product consistency. Attach a rinse station and faucet for a complete pasta station. Cook pot is made of special marine grade stainless steel specifically for water applications. Special copper flashed heat exchangers transfer heat directly into the cookpot for maximum efficiency and instant recovery. Super sensitive thermostat maintains water temperature within +/- 1 degree F.
Built in manual water fill enables the operator to adjust water input for continuous refill (upgrade option). Manual water control eliminates the need for complicated floats and costly components. Overflow area safeguards against accidental overfill. Skimming area provides a place to continuously remove starch build up. Temperature range: 190 - 212 F.
Safety control turns off main gas supply at 250F. 6" adjustable chrome plated legs.